Jean-Jacques Dordain, ESA Director General, and Waldemar Pawlak, Polish Minister of Economy, exchange the signed agreements (Credits: ESA). Poland took a step further in its relations with ESA by exchanging Accession Agreements on the ESA Convention on 13 September 2012, to become the 20th ESA Member State. The ceremony took place at the Copernicus Science Centre in Warsaw, with the participation of Jean-Jacques Dordain, ESA Director General, Waldemar Pawlak, Polish Minister of Economy, and Grażyna Henclewska, Under Secretary of State in the Polish Ministry of Economy. Other government officials and dignitaries attended the ceremony, including representatives from the Polish Parliamentary Group in charge of space affairs. 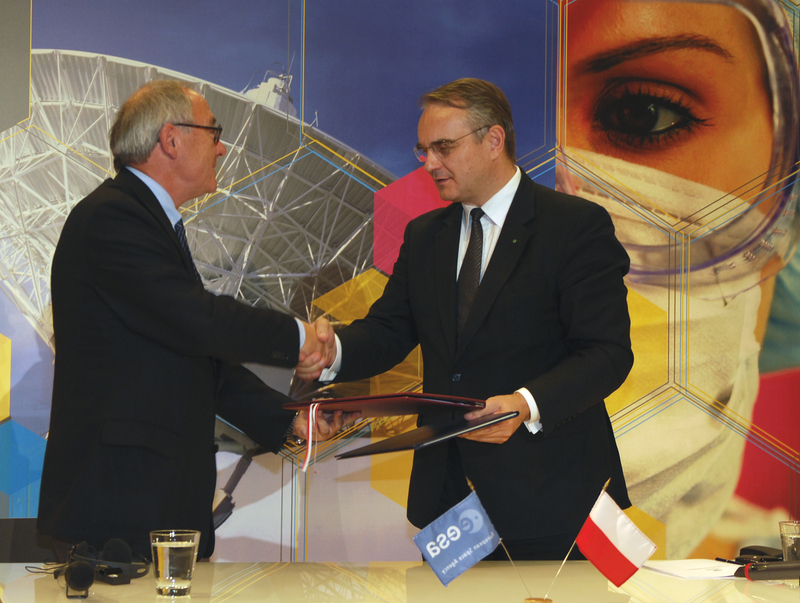 Poland’s cooperation with ESA is long-standing. In 1994, Poland was one of the first Eastern European countries to sign a Cooperation Agreement in the field of the peaceful use of outer space with ESA. A second step, the signature of European Cooperating State Agreement in 2007, paved the way for the Polish participation in several ESA research projects. Poland has a long aerospace tradition and has contributed to many scientific and technological projects. Poland has participated actively in several ESA science missions, such as Integral, Rosetta, BepiColombo and Solar Orbiter, and in Earth observation activities with Envisat and GMES. It is also working on ESA microgravity and exploration programmes, on EGNOS for navigation and on the Space Situational Awareness Programme (focusing on space weather), as well as in technology activities and educational projects. PW-Sat – the first Polish student satellite, was launched by a Vega rocket in February 2012. The Government of Poland plans to conclude the ratification process at the earliest and once the ratification instrument is deposited with the Government of France, Poland will become officially the 20th ESA Member State and will participate in the ESA Ministerial Council in November 2012 as a full Member State. ESA has 19 Member States: Austria, Belgium, the Czech Republic, Denmark, Finland, France, Germany, Greece, Ireland, Italy, Luxembourg, the Netherlands, Norway, Portugal, Romania, Spain, Sweden, Switzerland and the United Kingdom, of whom 17 are Member States of the EU. ESA has Cooperation Agreements with nine other Member States of the EU and is negotiating an Agreement with the one remaining (Bulgaria). Poland is in the process of becoming ESA’s 20th Member State. Canada takes part in some ESA programmes under a Cooperation Agreement.